What It’s About: After an unnamed war, a wandering ex-soldier with no name (Patrick Swayze) travels to a small town to investigate the murder of his ment0r Cord (John Fujioka). Why Watch it Today? : Today is the World Day to Combat Desertification, and Steel Dawn revolves around the primacy and value of water as a resource in a world made desert by the ravages of war. It is also an amusing, if at times very silly, Post-Apocalypse updating of the Western Shane, with a fun cast that features many “that guy” actors, including Brion James, Anthony Zerbe, Christopher Neame and Arnold Vosloo. 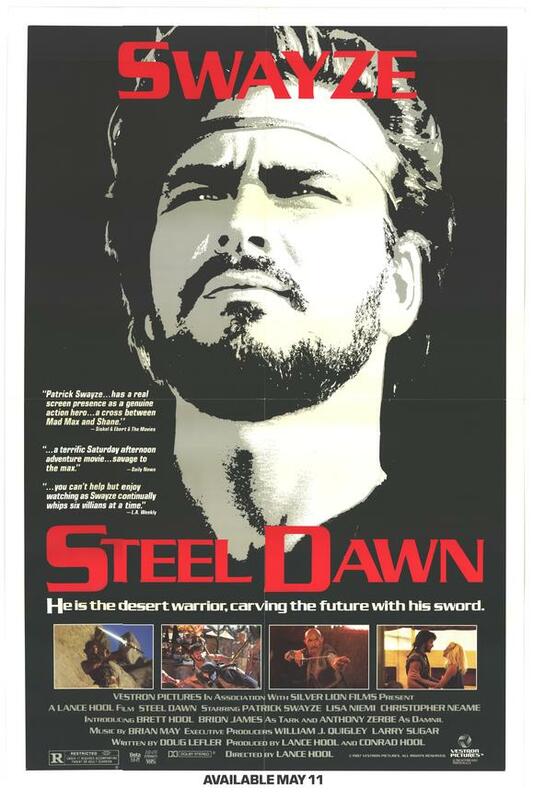 This entry was posted in Action, Apocalypse, Dark Future, Independent, Martial Arts, Movie of the Day, So-Bad-It's-Good, Western and tagged Anthony Zerbe, Arnold Vosloo, Brion James, cash-in, Christopher Neame, homage, John Fujioka, low-budget, man with no name, Patrick Swayze, rip-off, veteran, wanderer, water rights.